Mahatma Buddha was born in 563 BC in a Kshatriya family. His father's refinement was then the king of Kapilavastu. His mother's name was Mahamaya. Even after being born in a state family, Lord Buddha's mind did not feel in the palace and pleasures, and left home for a period of 29 years. After 6 years of wandering, he got knowledge under the people's tree in Bodh Gaya. Lord Buddha gave his first sermon in Sarnath, which is called the Dhamma Chakra initiator, Lord Buddha did not believe in the authenticity of the Vedas, his approach was a scientific approach. 1. 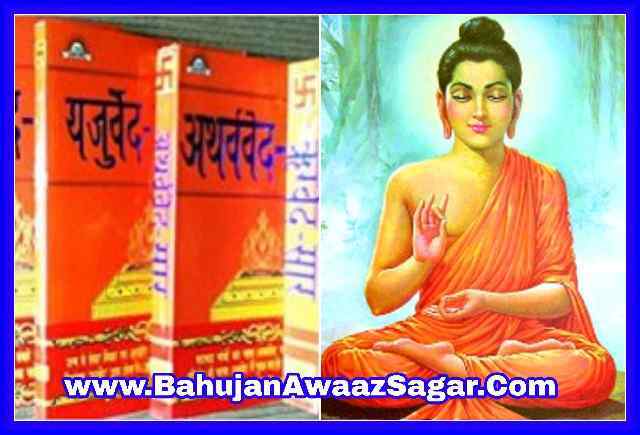 Where in the Brahmin religion (Hinduism) the Vedas are said to be God's creation, Lord Buddha did not believe in the existence of God, in response to the questions of Vasattha and Bharadwaj Brahmins, Lord Buddha Lord Buddha had said that when Nobody saw Brahma? If no Brahma Brahma was interviewed then how do you believe that Brahma is the existence of Brahma? 2. Where Brahmin Dharma (Hinduism) has said, that no word of Vedas vedas can be questioned. While addressing the same Kalam Kshatriyas, Tathagata Gautam Lord Buddha had said that there can not be any such thing which is completely inadequate with the possibility of being wrong, not even the Vedas, therefore Lord Buddha said that everything will be tested and amended. Tathagata continued the statement, "O Kalam, do not think of any thing just because he has come to your hearing, do not think of anything just because he came from tradition. Just do not think of any thing (hence) that many people are his supporters, do not just think of any thing that it is written in the scriptures, do not think of any thing just because he is a respected teacher "Before accepting something, it should be thoroughly examined by his wisdom and discretion, and when it seems that a thought is of interest to everyone, then he should accept it. 3. Hinduism (Brahman Dharma) states that the creation of the world has been done, the same God Buddha had said in the discussion with the Wassetath Brahmins and Bharadwaj Brahmins, that if God has created the universe, then by what matter Creation has created the universe. If there was a substance coming before the creation of the universe, so that God has created the creation, then God can not be called the first creator of creation, God is unknown, invisible, nobody can prove that this world is God Has created the world has not been created. 4. According to Hindu religion Brahmin is the highest, Brahmin class is highest because Brahmin class has originated from the mouth of Brahma, Lord Buddha had said in response to Ashwaleen Brahmin's question that when the women of Brahmins were women of other classes As is the season of birth, conceive, give birth to children, how can it be said, that is the best. 5. In the Vedas, the social system of the character has been called ideal society system, reading and teaching of Brahmin's work, doing the duty of the Kshatriyas and protecting, doing business of Vaishyas and doing work of shudras for the above three characters To serve, Lord Buddha replied in the answer to the question of Asura Brahmin, that if Chatwarna is an ideal society system then Yavan and Kamovos will be in neighboring countries. This caste system do not apply. Lord Buddha said further, as far as I am concerned, one should do the same profession, the business in which his condition is good, and that business should be abandoned, due to which his condition is bad. 6. According to the Brahmin religion, according to the religion of Shudra and women of all sections, the right to write and worship is not the right because women are impure, but Lord Buddha did not consider such a thing; they gave birth to women like Mahat Prajapati Gautami, Yashodhara, Nature's Sundalika Dixit in his religion, and without any discrimination in Pali, Barber, Bhangi Suneet, Untouchables, Brahmins and many kings, Damage done. 7. According to Hindu religion, to sacrifice the sacrifice of liberation or salvation of the soul is sacrificed in sacrificial animals and performing other religious actions and donating to the Brahmins, but Lord Buddha was against the sacrifice of animals in sacrificial animals, Ujjay In response to Brahmin's question, Tathagata Gautam Buddha had said, Hey! The sacrifice of a cow in the sacrifice of a cow in which the cow is slaughtered, goats and sheep are sacrificed, many kinds of creatures are killed, I do not praise such sacrifices. 8. According to Hindu religion (Brahmin religion), the person is born in the higher or lower total according to the good deeds of his previous birth, he did not consider any of the total elevated or low, when a Buddha family had a Raj family When people came together to take the initiation of Upali Nai, Tathagata Buddha first conferred the Nai Upali in the monk's Sangha, then after that he initiated the princes in the monk's union so that Shakya total It is possible to greet the Upstairs Barley as bigger than him, because before that Bhikkhu Sangha was treated as bigger. Nor did Buddha believe in the reincarnation of the soul, while speaking with Jain monks, stressed that happiness and suffering of the present life is the result of circumstances. Influenced by Tathagata Buddha's religion, most of the kings left the Vedic religion (Hinduism) and they became worshipers of Buddhism, among them King Ajatshatru of Magadha, whose kingdom was located in southern Bihar, Lichchavi of Vaishali state, Kapilavastu Shakya The total of which was born, the Ahakta ki Balli Ramgram Koli, the Pavah medal, and the Kushinagar prize were etc. The rulers of these states adopted Buddhism and Vedic Abandoned Rm. In the third century BC, Emperor Ashoka abandoned Vedic religion and became a devotee of Buddhism, became a devotee, Emperor Asoka promoted Buddhism throughout India as well as abroad, King Kanishka and sixth in the first century In the century, King Harshavardhana also became a worshiper of Buddhism after leaving Vedic religion. The disintegration of people from Vedic religion has continued and there has been a continuous erosion (vandalism) in Vedic religion.